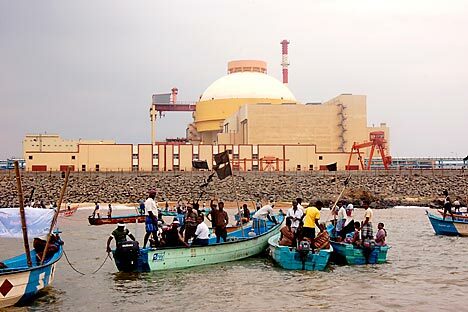 With experts' panels declaring the Kudankulam plant safe, the Indian government is resolved to break the stalemate soon. Six months after the Fukushima radiation last year, a group of protesters mysteriously started targeting the Russia-built Kudankulam Nuclear Power Plant (KNPP) in Tamil Nadu, raising questions about the safety of the nuclear facility. The plot has only thickened as more than 200 days later, the agitators appear to have no intention of giving up their movement which is led by the People’s Movement Against Nuclear Energy, a coalition of anti-nuclear activists. But all is not lost: the past few weeks have shown an increasing momentum for resolving the deadlock, with Indian Prime Minister Manmohan Singh throwing his full weight behind the nuclear project. In February, the mild-mannered prime minister, who earlier managed to pull off the India-US nuclear deal in the face of an unrelenting opposition, showed a similar decisiveness when he intervened and blamed foreign-funded US and Scandinavian NGOs for stoking the anti-KNPP agitation. The message was clear: the Indian prime minister, as he had promised then Russian president Dmitry Medvedev in Dec 16 last year, was determined to get the Kudankulam power units rolling. Meanwhile, a four-member expert group set up by the Tamil Nadu government to assess the safety infrastructure of the KNPP has submitted its report. “We have reviewed all concerns raised by the protestors in our report. We also analysed the central expert group committee's report, which has answered all 44 questions raised by the protestors. We found the report satisfactory,” said Srinivasan, a former chairman of the Atomic Energy Commission and a member of the panel. The experts’ group is understood to have concluded that the KNPP was well-equipped to withstand natural calamities, be it earthquake or tsunami. The state government committee was preceded by a 15-member Experts Group set up by the Indian government which after examining the plant in the context of Three Mile Island, Chernobyl and Fukushima accidents, declared the plant safe. Government sources indicate that the first 1,000 MW unit of the KNPP will be opened as soon as the project's safety audits have been completed. According to the Nuclear Power Corporation of India, the two units are “99% and 94%” ready, and it is estimated that the first unit can be up and running within six to eight weeks. “I am hopeful of moving forward. The expert committees have done their job. Safety issues have been addressed. The plant's first unit can be in working order once we are able to move in the required staff,” says Srikumar Banerjee, secretary at the department of atomic energy. “The plant has been idle and so the AERB will lay down guidelines. Once these are followed, the plant will generate power,” says Banerjee. Another factor that is expected to spur the resolution of the stalemate is an acute power crunch facing Tamil Nadu, which is set to become more severe in the coming summer months. “My hunch is that the Tamil Nadu government will take a decision as early as possible” on the project, V.Narayanasamy, Minister of State in the Indian prime minister’s office, said recently. There is a strong likelihood that the impasse will be broken soon. In many ways, the Kudankulam agitation is a test case for India’s ambitious nuclear energy plans as it goes on to increase tenfold atomic energy to 40,000 MW by 2020.